We’re not sure which is worse: the boot or the ringlet-style mullet? Upon retiring in 1988 having represented Liverpool some 200 times throughout the 1980s (yes, he appeared in The Anfield Rap – “I’m very big down under but my wife disagrees!” was his crowning glory), Australian midfielder Craig Johnston took up boot design. He started with a hit, producing the early prototypes for the Adidas Predator – initially using the pimply rubber stuff on table tennis bats glued onto his old boots – in the early 1990s, which went on to become Adidas’ most pre-eminent boot line. Indeed, it still is to this very day. He also invented the ‘Traxion’ sole plate that was used in several Adidas boot designs throughout the decade and beyond. Johnston wasn’t finished there though, oh no. The creative urge struck again in 2003, when the spectacularly coifed Aussie began drawing up designs for a detachable rubbery ‘skin’ that could be pulled over the end of any boot to increase the friction a player could achieve between his toe and the ball – much in the same way the Predator does. 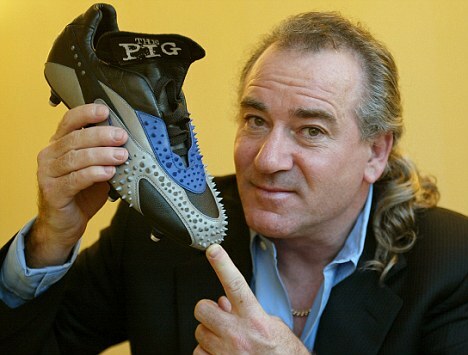 Johnston called his lumpy design ‘The Pig’ boot (P.I.G standing for “Patented Interactive Grip” – in fact, here is the patent) and the concept was hawked around various companies, with Nike, Adidas and Reebok all passing due largely to the fact that it was – as it’s name suggested – monstrously ugly. In technical parlance, there was a significant shortfall in The Pig’s aesthetic qualities. Adidas eventually had a nibble and got Franz Beckenbauer to try out a redrafted version of The Pig, but a production boot never materialised – though the design did score Johnston a nomination for the Design Museum’s Designer of the Year Award in 2003. Since then, Johnston has been declared bankrupt and homeless after his idea for inner-city football schools fell through, but has since carved out a decent career as a photographer and part-time football pundit around the world. The late 70’s US version of the Adidas Beckenbauer studs used the ping-pong paddle material. Great out of the box, but pretty useless when the pitch was muddy. I may be wrong but I think he co wrote the Anfield Rap too, the man is a genius. Retired from football to look after his disabled sister too.